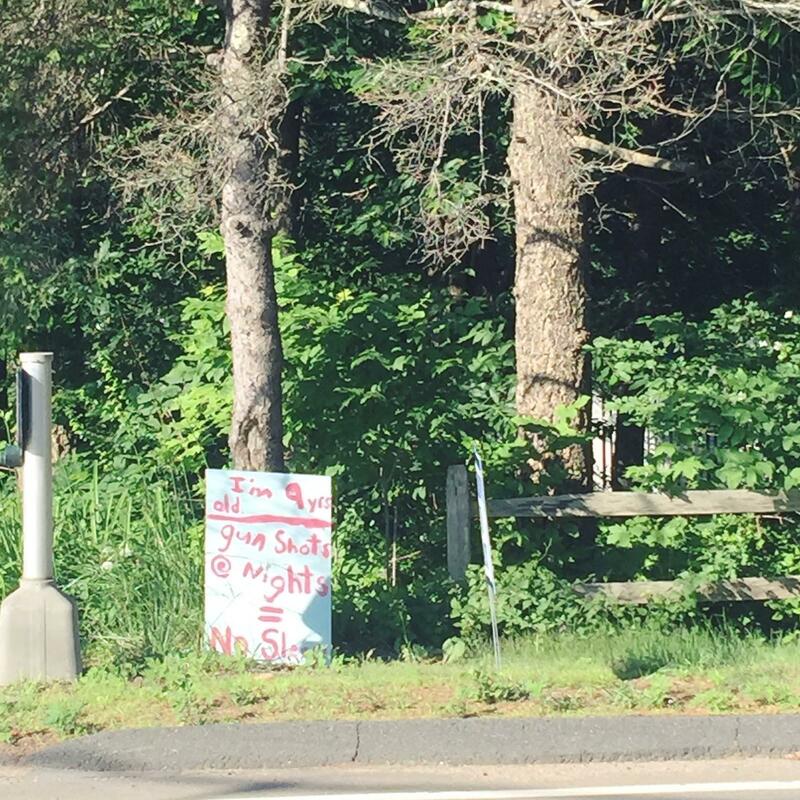 A sign in Willington reads, "I'm nine years old. Gun shots at nights = no sleep." Willington First Selectman Christine Mailhos speaks at an unWillington rally. Residents of Willington, Connecticut meet Tuesday to discuss the proposed relocation of a large state police firearms training facility to the small New England town. Opponents of the idea have created a new website: unWillington.com. Cari Donaldson used to live close enough to the current state police training center in Simsbury that her family could hear gunshots from the rifle and pistol ranges when they hiked on Talcott Mountain. "It was very jarring and unpleasant, but a necessary type thing, obviously," Donaldson said. "And then this past April, we moved here to Willington." 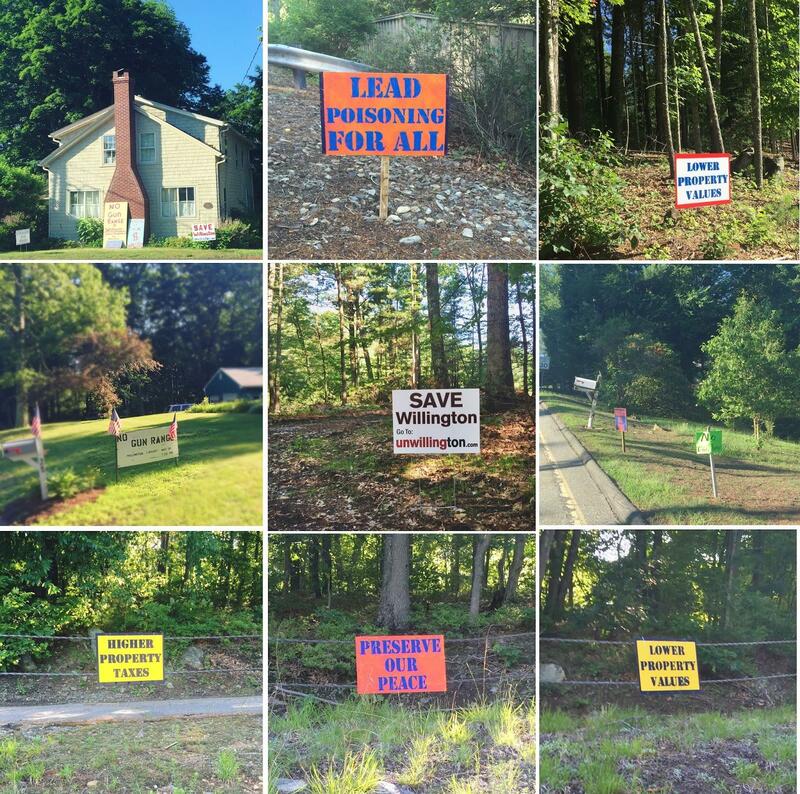 Not long after, Donaldson's husband called to say he’d seen a sign go up in town saying the state police firing range might also move to Willington. "I said, you’re lying! We just left that thing behind," Donaldson said. "And from there, I’ve learned -- to my horror -- that we’re not talking about relocating the Simsbury site. They’re proposing something that’s ten times the size: from two firing ranges only one can be used at a time, to four firing ranges which can be used all the time." The current facility, built in the 1940s, has classrooms and a multi-lane pistol range with a separate rifle and shotgun range. The state police firing range in Simsbury, Connecticut. Because the rifle range is located directly behind the pistol range, it's been unsafe for the two to be used simultaneously. But the real problem with the Simsbury site has been that it's in the Farmington River flood plain. After years of wrestling with flooding issues, a decision was made to move. The proposed new facility is expected to have about 55,000 square feet of multipurpose training space, as well as separate pistol, active shooter, rifle, and shotgun ranges. Sites in Willington and East Windsor are under consideration. Protest signs around town in Willington show the variety of concerns residents have about a proposed police training facility. "When you start looking at it, there’s a lot of question marks," said Stef Summers, one of the founders of Unwillington.com. "They make a reference to hosting local, national, and international groups, and SWAT teams there, and no one can really put their finger on what they mean by international or other national groups. So then you start thinking, wow, this could be a big change to the nature of the town." The proposed site in Willington is private land. But Summers said the state already owns or operates land in Connecticut that’s more conducive to this kind of project. "They have eight gun ranges already that are state operated," Summers said. "And they have a lot of land that is not the middle of a rural residential community." The State Department of Emergency Services and Public Protection is leading the relocation process. Right now, officials are in the early stages of an environmental impact evaluation. "How is it going to impact the flora, the fauna?" said Robert Klee, Commissioner of the state's Department of Energy and Environmental Protection. "We think about endangered species, and wetlands, and those sorts of impacts of these types of activities." Speaking last week to reporters, Governor Dannel Malloy said officials are nowhere near a decision as to where the firing range will ultimately be built. "I think local concerns have to be heard in those deliberations. There is absolutely no decision that’s been made with respect to where this facility will go," he said. So far, the state bond commission has approved $325,000 of a $700,000 request for the initial planning process. At this week’s meeting, residents will decide whether to appropriate local funds to hire their own legal and environmental professionals to help evaluate what it would mean if the state relocates a new state police training facility to the small town of Willington. In an email to WNPR, a state spokesman said the state as yet has not determined a budget for the project.